The Appeals Chamber of the International Residual Mechanism for Criminal Tribunals composed of Judge Vagn Prüsse Joensen, presiding, Judge William Hussein Sekule, Judge José Ricardo de Prada Solaesa, Judge Graciela Susana Gatti Santana, and Judge Ivo Nelson de Caires Batista Rosa delivered today its judgement on the appeals filed by Mr. Radovan Karadžić and the Prosecution against the judgement rendered on 24 March 2016 by a Trial Chamber of the International Criminal Tribunal for the former Yugoslavia (“ICTY”). Mr. Karadžić, who was a founding member of the Serbian Democratic Party and, from 17 December 1992, served as President of Republika Srpska and Supreme Commander of its armed forces, was convicted by the Trial Chamber of genocide, crimes against humanity, and violations of the laws or customs of war and sentenced to 40 years of imprisonment. Specifically, the Trial Chamber found Mr. Karadžić individually criminally responsible through his participation in joint criminal enterprises to: (i) permanently remove Bosnian Muslims and Bosnian Croats from Bosnian Serb-claimed territory in municipalities throughout Bosnia and Herzegovina between October 1991 and 30 November 1995 (“Overarching JCE”); (ii) spread terror among the civilian population of Sarajevo through a campaign of sniping and shelling from late May 1992 until October 1995 (“Sarajevo JCE”); (iii) eliminate the Bosnian Muslims in Srebrenica in 1995 (“Srebrenica JCE”); and (iv) take United Nations personnel hostage in order to compel the North Atlantic Treaty Organization to abstain from conducting air strikes against Bosnian Serb targets from 25 May to 18 June 1995 (“Hostages JCE”). The Trial Chamber also found Mr. Karadžić responsible as a superior in relation to certain crimes committed by his subordinates in Srebrenica in 1995. The Appeals Chamber reversed, in part, Judges Joensen and de Prada dissenting, Mr. Karadžić’s convictions related to the Overarching JCE to the extent that they are based on certain Scheduled Incidents. 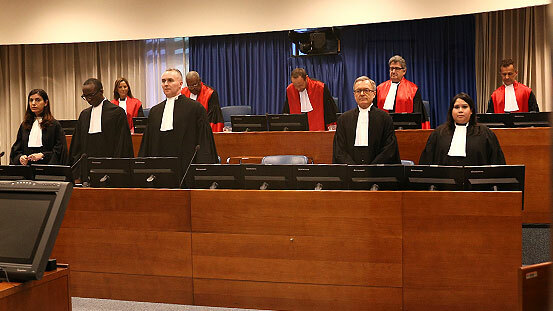 The Appeals Chamber unanimously dismissed all other aspects of Mr. Karadžić’s appeal and affirmed his remaining convictions pursuant to Articles 7(1) and 7(3) of the ICTY Statute for genocide, persecution, extermination, murder, deportation, and other inhumane acts (forcible transfer) as crimes against humanity, as well as for murder, terror, unlawful attacks on civilians, and hostage-taking as violations of the laws or customs of war, in relation to his participation in the Overarching JCE, the Sarajevo JCE, the Srebrenica JCE, and the Hostages JCE. The Appeals Chamber dismissed, Judge de Prada dissenting, the Prosecution’s appeal, except as to the sentence. The Appeals Chamber granted the Prosecution’s sentencing appeal and found, Judges de Prada and Rosa dissenting, that the Trial Chamber committed a discernible error and abused its discretion in imposing a sentence of only 40 years of imprisonment. The Appeals Chamber, Judges de Prada and Rosa dissenting, set aside the sentence of 40 years of imprisonment and imposed on Mr. Karadžić a sentence of life imprisonment. Exclusively for the use of the media. Not an official document. The International Residual Mechanism for Criminal Tribunals (Mechanism) was established by UN Security Council Resolution 1966 (2010) to complete the remaining work of the International Criminal Tribunal for Rwanda and the International Criminal Tribunal for the former Yugoslavia after the completion of their respective mandates. The Mechanism has two branches, one in Arusha, Tanzania, and one in The Hague, Netherlands.